When I was a little girl, my sister and I loved to play with our food. We had to do this surreptitiously because my mum frowned upon anything that looked like wasting food or making a mess, but one of our favourite games, which could be played under the radar by two quiet little girls, was “The Giant’s Dinner”. Years later, I discovered that there were many other delightful ways to play with your food, such as Joost Elffers’ books and calendars of the same name, and the world of cute kyaraben. 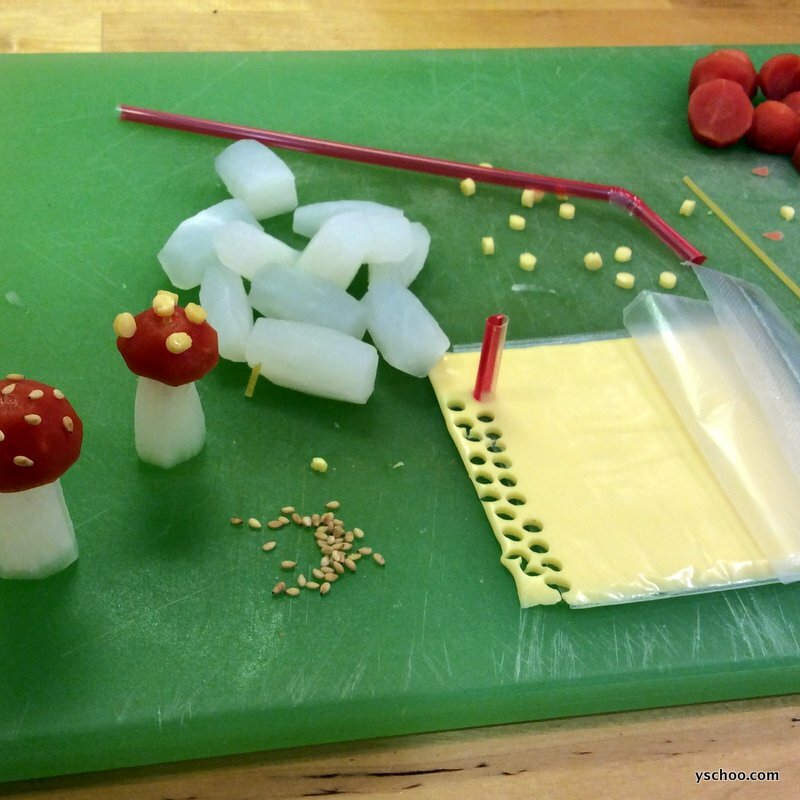 The other evening, as I was prepping my kids’ school lunch for the first day of 2014, I thought it would be fun to make them a surprise. Never mind that this thought occurred almost directly after looking at the pile of work waiting on my desk (the source of many impulses, such as leaving the house to buy necessities like chocolate. Or deciding to wash the car). Our local Trader Joe’s has recently started to carry bags of colourful organic carrots, some of which are a nice deep red. Perfect for a fly agaric mushroom. I once actually found some growing in a forest and they are every bit as cute (and deadly) as you might imagine from watching cartoons. 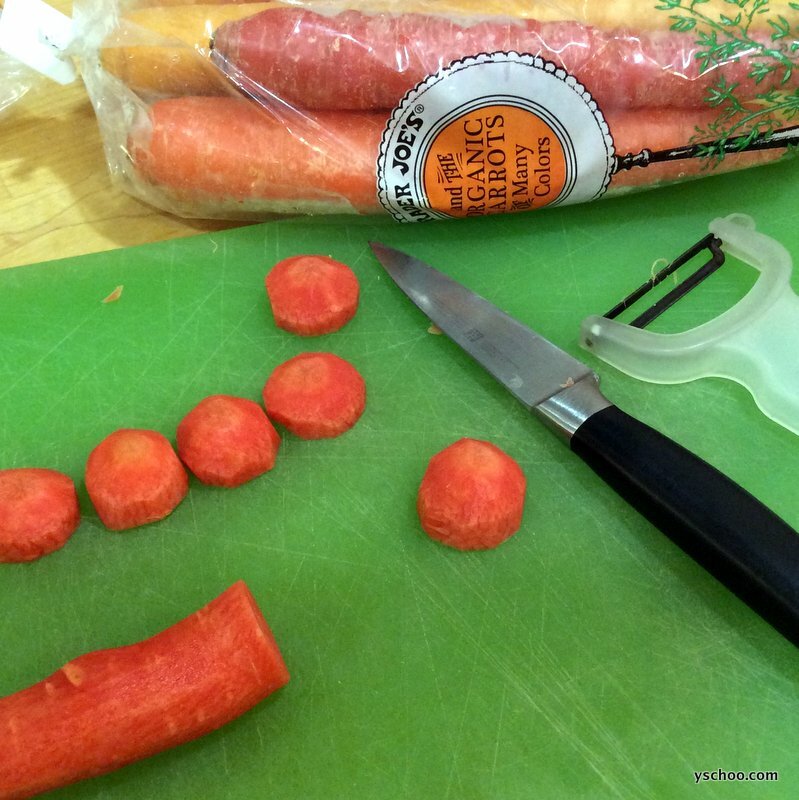 Peel your carrot of choice and cut into lengths about 1/2″ thick depending on the width of your carrot. Carve the tops so that they’re curved. 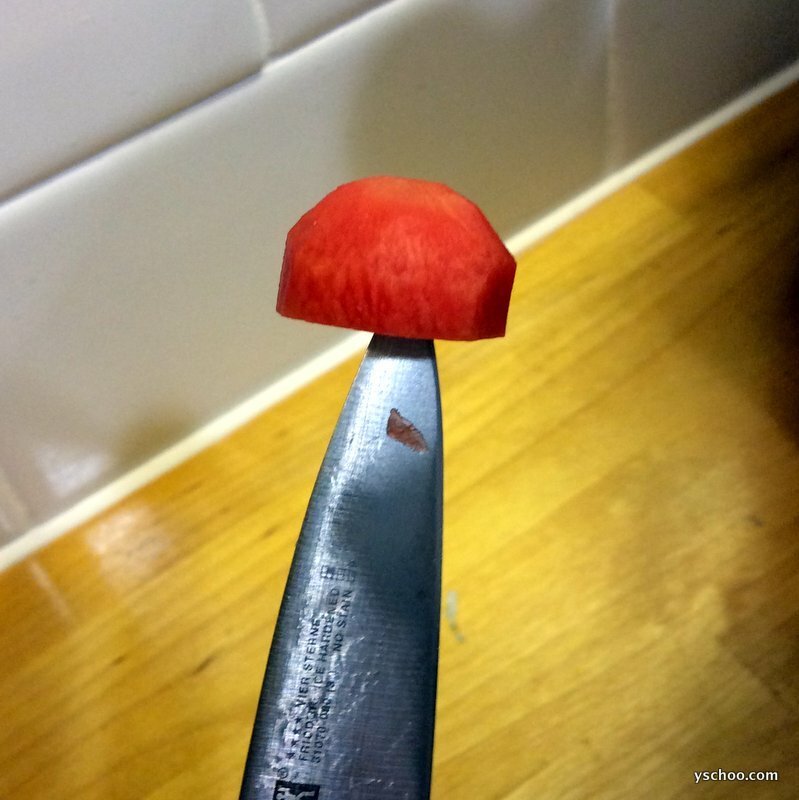 It helps to have a sharp paring knife. 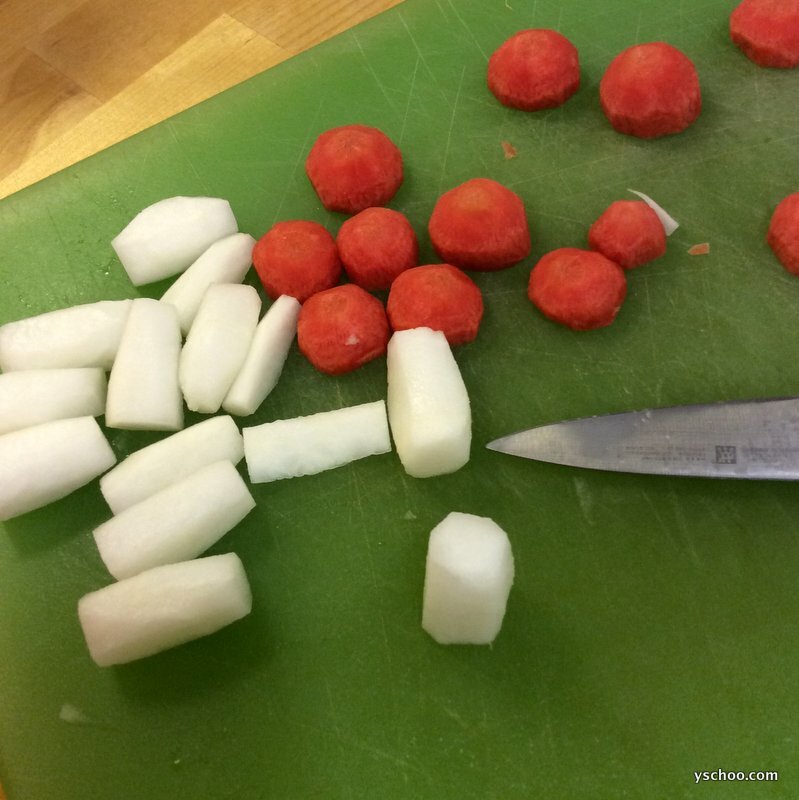 Make stems out of daikon. This large white radish is often found lurking around Asian kitchens where it’s used for everything from soup to salad. Daikon is supposed to detoxify your liver and promote digestion. It also happens to be a nice white colour and easy to carve. If you taper the mushroom stems at both ends, they’ll look more realistic. 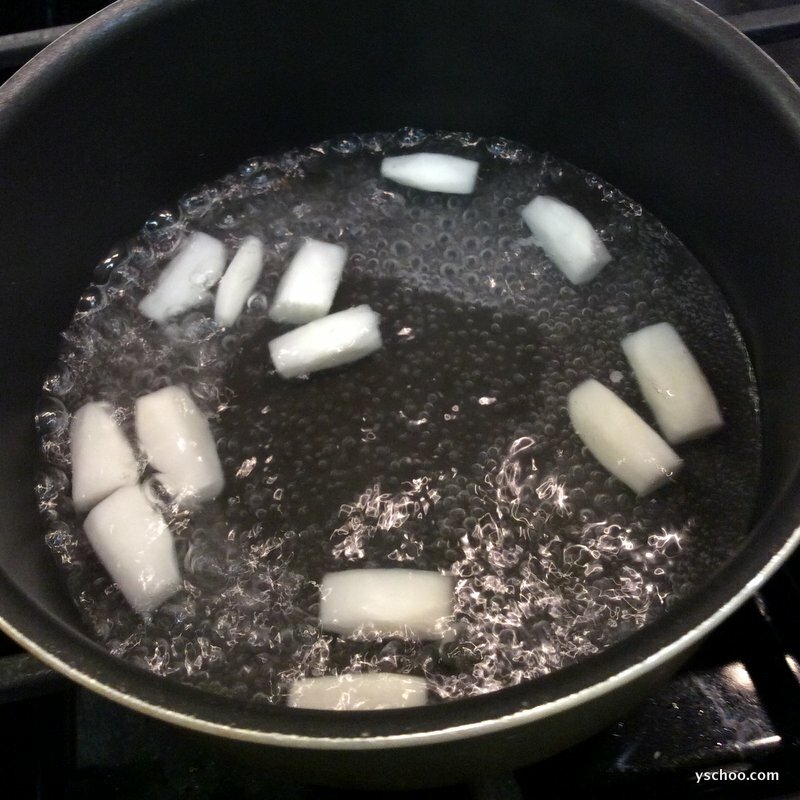 Boil the vegetables in a little water until just tender. I separated the daikon and the carrots because I was worried that the carrots might bleed some colour onto the white stems, but it’s probably ok to mix them. I added a little salt to the daikon when I boiled them, and a little sugar to the carrots. Another option would be to serve them with some dipping mayonnaise. I tried cutting out bits of cheese with a straw for the spots, but they ended up looking strangely blobby. Plus, cutting the teeny bits of cheese was driving me crazy. White sesame seeds are better. For a completely seamless look, a piece of uncooked spaghetti inserted into the mushroom will hold it up nicely, although the pasta will soften over time. Or just use toothpicks. The brussels sprouts were scored with an X on the stem, tossed lightly in olive oil and sea salt, and microwaved for 2 minutes with a little water. I made tamagoyaki (sweet egg omelette) using this recipe from one of my favourite blogs. 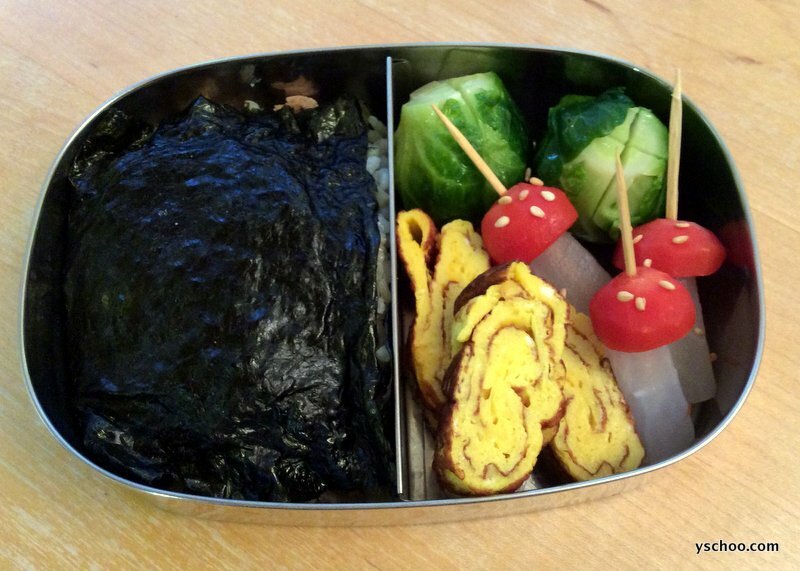 The dark thing on the left is a rice sandwich with ginger pork filling, wrapped in nori (seaweed). The pork was from dinner the night before, so it only had to be reheated. You can just pack leftovers for the main dish, which is what I usually do for kids’ lunches. I like the colour of the seaweed, which makes it look mysteriously woodsy. Or just black. 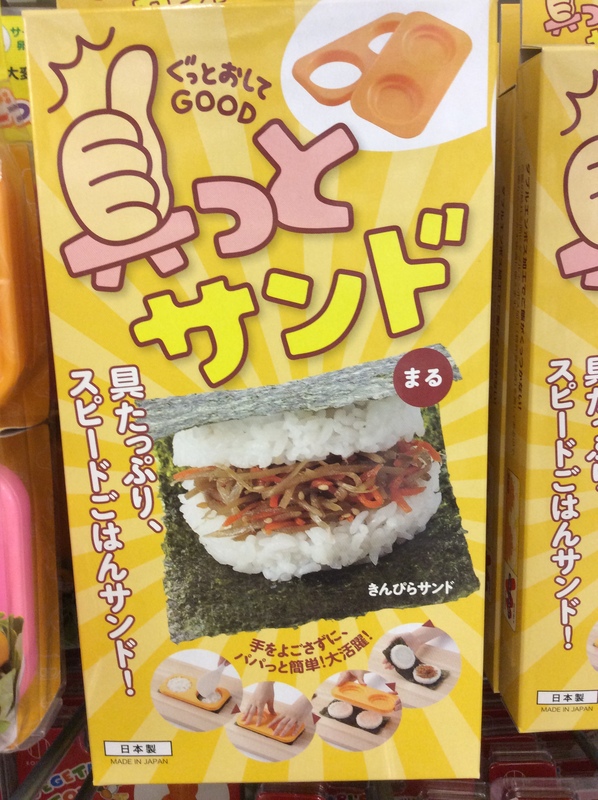 This was also a fun chance to try out the rice sandwich mold I found the other day at Marukai Market. Put hot steamed rice in and press to shape. It’s surprisingly easy and somewhat addictive to make. I had to stop myself from pressing out lots of these cute sandwiches, which can be filled with whatever you like. If packed for school, the seaweed does get a bit soggy but my kids didn’t seem to mind. I must confess it’s hard to say who had more fun with their lunch, the kids or me – although I had to caution them not to expect something like this more than, um, once a year. Play With Your Food, by Joost Elffers. These adorable pictures of vegetables crafted into different animals will ensure you never look at produce the same way again. If you’re not up to something elaborate, a piece of fruit or carrot and celery sticks with peanut butter. Happy new year, everyone! Here’s wishing you a tasty and delightful 2014! ← What to Eat If Your Book is Nominated for an Award? Oh my goodness! I gave my kids leftover rice-a-roni. I think you have me beat in both the “nutritious” and “cute” categories.